Saturday brought the boy’s first football match. The time had changed many times many times, but they decided that they needed to be at the pitch for 1:30. I did some homework with the little ones in he morning, and tried to get he boys to make sure they had everything they needed. I went back at just after 1, when we should have been leaving, and some of the boys were still eating lunch and others had just arrived back from tuition. I got Godfrey, the eldest boy, to help me get the kit out, which is when we discovered that there were only 8 shirts… They are green so the boys also brought their green bibs too. Some of the boys started to leave around 1:45 and I left with the last at nearer 2 after grabbing some of my socks to hand to Saidi. When I arrived at the pitch some boys were up in the stand at the pitch. Annie had come to watch with Gidion, one of the kids who lives at her host family’s house. We waited for a good 45mins for the other team and Bruno to arrive. A man selling ‘ice-cream’ arrived and you could get one for 100ts. The cones were smashed at the top and the ice cream tasted like ice with a raspberry syrup in; but it was really good. Jamie arrived with the some of girls and younger boys as the lads were warming up. Bruno rang some friends and organised some football kit, complete with shorts, that the boys could use – Bruno wants them to train and play seriously. As he ran back to get it, the game started and he left me in charge of the team. We started the game really well and had a 2-0 lead within 15 mins. Innocent, a boy not from SWIWSCO, scored them both and was the standout player throughout the game. Both goals were really good, as he had to run past half of the other team before finishing strongly. Hassan grabbed a third goal before half time and things were looking really good. The boys changed into their new kit and headed out to build on their lead. Bruno introduced Haruna & Nurdin after 10 mins (the game was 70 mins long) and brought Godfrey and Saidi. The other team played much better in the second half, and the team missed Godfrey and Saidi. They scored 2 and it made for a close finish. The boys held out and won the game. Jamie said goodbye to the kids on Saturday night, as she was leaving on a 6:30am bus to Nairobi. After spending a morning at SWIWSCO, I spent the afternoon with Pam creating a budget for SWIWSCO and the volunteer house in Excel. Pam uses Excel at work so knows how to use the basics and I taught her a few more things as we worked through this long project. After 5 hours we had got some really good foundations down and she fully grasped what I was hoping to help her achieve. Two more volunteers arrived on Sunday night. Melina & Maria; both from Sweden. Maria will be working in SWIWSCO & maybe teachings and Melina will be volunteering at the baby orphanage, Upendo. The girls are terrified of spiders and a large amount had materialised in their room. Witness brought a duster and we set about removing them from the room. After answering questions the girls had about being here, we headed over to SWIWSCO for an hour. It was great that boys played and won their first match. They love football. They have a chance to play competitively and have such a great coach, it’s just a fantastic opportunity for them. Saturday morning and the sun was out. I joined Kristine in doing some washing. We had no hot water so it made washing a little more difficult. I ventured alone this time, spending over an hour washing. The weather was nice so, it made doing the washing not too bad. After washing I wrote some of my blog before going to SWIWSCO. Everybody seemed very quiet today. After lunch I Skyped with Mum and Dad for the first time. I returned home and headed to SWIWSCO again. The boys had football practise, so I helped the girls with a bit of cooking,.I basically try do things but do them wrong mostly. I try, they laugh, it all ok.
Sarah was feeling off for a few days so she headed to the hospital. Kristine, Jamie and I were heading out for food again tonight. I grabbed a beer from a local shop – You get some discount for handing back a bottle when getting another. We were meeting Sophia & Nicola at El Rancho (which is an Indian restaurant but was a Mexican and the owner never bothered to change the name…) at 7. It’s a 40 min walk from ours so we decided to do that as it was such a nice day and the walk is also nice with tree lined roads. The place was very busy. The service was slow but the food amazing. Sophia had the great idea of sharing all our dishes. We had a wide range of vegetarian and meat dishes. All of them where very different and really good. It was more expensive than other places but I paid £10 for food, 2 beers and some water. It’s great to meet with different people who are also volunteering out here. It was a reminder for me of why I love travelling. There were 5 of us, each didn’t know each other a few weeks ago, all from a different country, yet we were having a meal like friends who’d known each other for years. Sunday morning was suppose to be the boys football match. It had been moved from 4 to 1 to 9 and now had been cancelled. 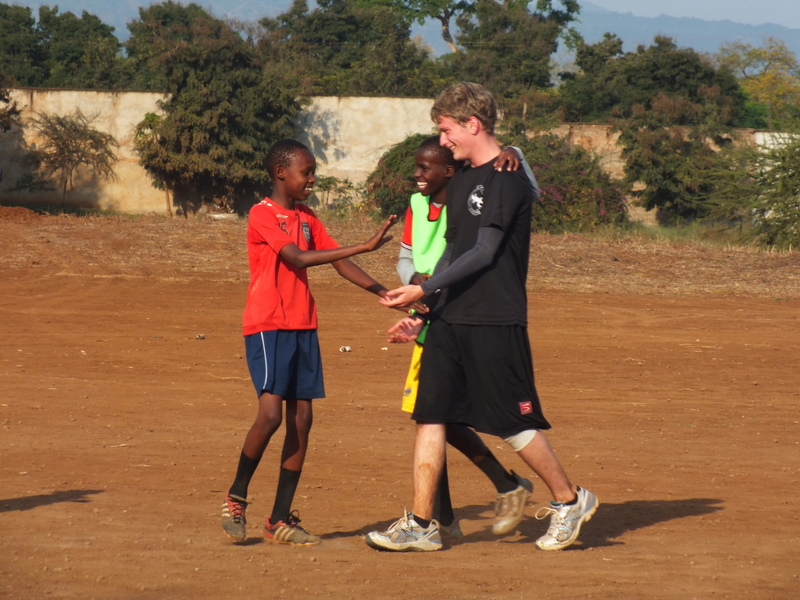 The other team had just decided to go to Arusha in the morning… I had a lazy morning. Bruno, the boys coach, came to our house just as lunch finished. His team was in a cup quarter final and I was taking the boys to go and watch the match. He told me to follow him to see where we would get the bus from – it was a house just round the corner. I was then invited in and had my hands washed before being invited to sit down. The rest of Bruno’s team was there. Most of the team were all crouching around a large metal tray which had Pilau with Banana, Potato, Beef and salad in. It a very intimate way to eat; all sharing a meal using your hands, especially for a team before playing a match. There was no room for Bruno round the tray so he was handed a huge plate of food, as was I. I tried to turn this down, I’d just had lunch 5 mins ago and didn’t want some of them to not have more. My protests were shrugged off and I attempted to eat a second lunch. It was brilliant. The chef was one of the players who was a cook & guide on the mountain. After eating I was slightly confused at my presence at the house, we had 90 mins before we left, so I said bye and headed to organise the boys for leaving. Kristine and I spent ages rounding them up as they all dressed up to go. We went back to the house with 9 of the boys and waited for a Dala Dala. Our boys and 17 more supporters pulled in. The pitch was about 15 mins away and was a solid dust bowl. The area was very different to the rest of Moshi I’d seen. It was looked like a poorer district and there were far more people dressed according to their religion. We had to wait for 40 mins for Bruno to turn up. In the mean time about 100 people gather around and some nets were erected. Bruno arrived with the rest of the team at 4 (when the game was suppose to start). After a quick warm-up the ref lined both teams up and the game began. The crowd had swelled to nearer 400, with Kristine and I being the only non-tanzanian’s there. We got a fair few stares and kids gasping at us. I had my camera with me and 4 of the boys separately told me to keep it close and be careful. The game was a much higher standard than I though. Our team, Soweto (after the district we live in) scored in the first minute due to a bad mistake my one of the defenders and the keeper. They also converted a penalty in the second half to win the game 2-0. The crowd was at least 800 by the end, with many kids up trees. Bruno is a keeper and is very charismatic on and off the pitch. All our boys mobbed him after the game. We piled into a Dala Dala again, which was extremely I noisy on the way back. It was a private hire so I got Hassan to translate for me to pay. It appears we payed for the entire supports bus, which I don’t mind. We needed to hire one to get there so we might as well fill it for 15,000ts – £6. Jamie had bought ingredients for a special meal for us all. The older girls and Pam spent hours making the 3 courses. There was a pumpkin soup to start. A lovely beef and potato stew for main and 3 different cakes for desert. A fantastic way to end a brilliant weekend. The boys had great fun and were really well behaved. I will hopefully take them to the semi-final. I had a onimusly large pile of washing that I needed to take care of. I took the plunge and asked Hassan for some help who brought Rogat with him to Collin’s house. I have never hand washed more than my socks and boxers when I was in Singapore so I was in need of some reinforcement. My hands didn’t stand up very well to the scrubbing and I had several cuts on them when we finished! Hassan was a real master, and worked wonders on one of my white sports t-shirts with just cold water and a bar of soap. A new volunteer, Jane, arrived on Thursday night. She had slept in the previous few days as she was recovering from climbing Kili. We took her over to spend some more time with the kids and try to learn some more names. After lunch I headed to the internet café again to book a few more things for Zanzibar. The three of us headed back to SWIWSCO for 3, as the boys were suppose to be heading to football for 3. Using some really good African time we set off nearer 4… After a while we managed to sort some teams and play a short game. In which I managed to score an own goal… bad times. The boys had told me a coach had run a session with them yesterday and he turned up again today. 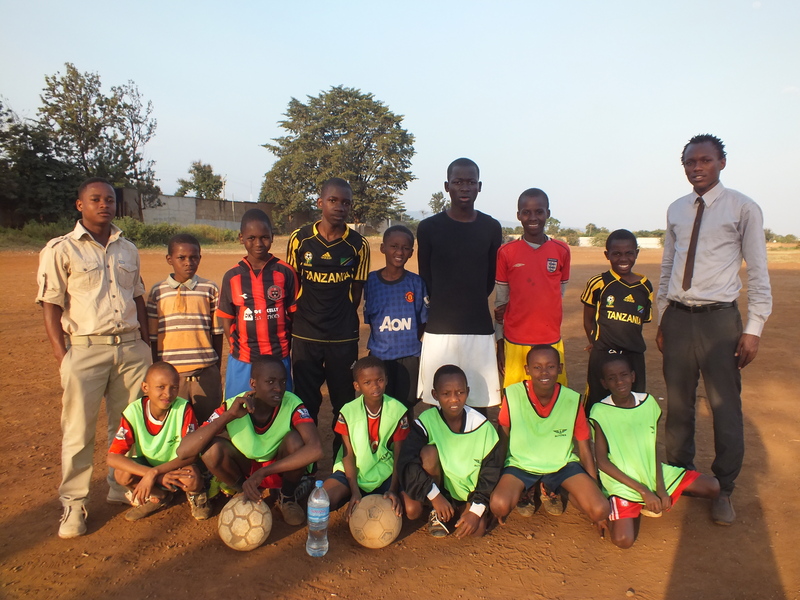 Bruno play’s for Moshi and before being injured played in the top flight of Tanzanian football. The boys listen intently and had a great session. I was really impressed how well they listened. 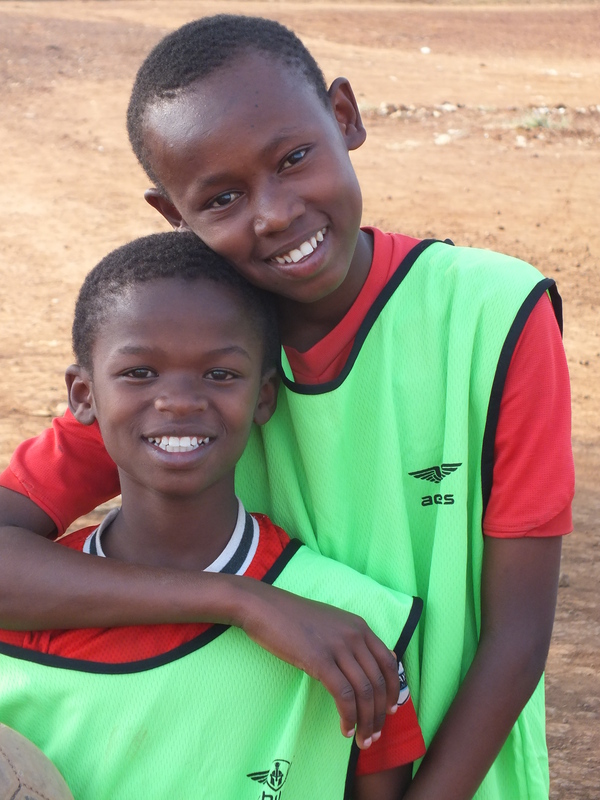 They boys have a game next Sunday against another children’s home. Sarah, the other volunteer at SWIWSCO, decided to make a ‘special meal’ for the kids tonight. Pam was hard at work preparing the food at our house. We had meatballs and tomatoes sauce and it was brilliant. Really nice to have some western food two days in a row. The food wasn’t ready till 8 though and it took quite a mission from Kristine, Witiness, myself and some older to get it over to SWIWSCO and serve it all up. They really enjoyed though, so it was worth it. It was yet again a brilliant weekend. I like spending some time away from SWIWSCO, not because I don’t enjoy my time at SWIWSCO, but it makes me appreciate it more when I am there.